Surface Finish: enamel paint and ss mirror polish. with heavy structure and heavy bering. Jar Mill used for Powder Pulverizing. A double jar model with Ceramic Jar and Balls, used in Mineral Mining Industries such as Terra Nova Minerals Limited. 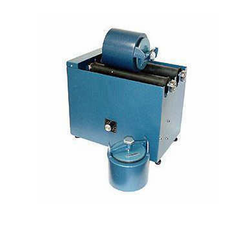 We are ranked amongst the most trusted firms deeply engaged in offering a wide range of Jar And Pot Mill. MIKRONS® Jar mill updates and improves material processing through a simple yet efficient contamination free grinding process. They are designed specifically for applications where space is at a premium. Available in single and multiple tier models and with roll length of 300, 600, 900, 1200 mm. MIKRONS® Jar mill updates and improves material processing through a simple yet efficient contamination free grinding process. They are designed specifically for applications where space is at premium. Available in single and multiple tier models and with roll length of 300, 600, 900 &1200 mm. Renders jar mill is the most stringent requirements of the chemical, ink, paint, plastics, food, ceramic and pharmaceutical industries. Our jar mills are ideal for grinding laboratory or high-purity samples. These mills provide quiet and smooth operation. The speed can be varied from 10 to 260 rpm using vfd. - Power driven twin rubber lined parallel shafts 1.5 meter long. - Geared motor drive to shafts. - Two free turning adjustable stopper disks. - Provision for adding second tier driven by existing drive. - Electrical Load: 0.75 KVA. We are manufacturing wide range of Size Reduction Technique (Jar Mill).